Limited. Ships within 1 business day. Mordenkainen hails from the City of Greyhawk, but over the eons he has expanded his mastery of the major conflicts in the multiverse. Similar to 2016's Volo's Guide to Monsters, Mordenkainen's Tome of Foes not only contains everything you need to run challenging new monsters at the table with your friends but also provides tons of storytelling information on some of the most contentious relationships in the multiverse. You'll learn more about the schism between drow and other elves, githyanki and githzerai, and dwarves and duergar, in addition to reading about the incessant Blood War between demons and devils. 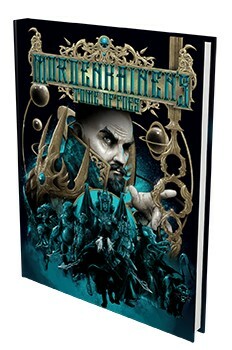 Players will love to delve into Mordenkainen's Tome of Foes to search for story hooks to use with their characters, as well as try out some of the player options for races like tieflings and elves, or maybe an otherworldly githyanki or githzerai. Dungeon Masters looking for inspiration and greater challenges for players who have reached higher levels of play will find much to explore in Tome of Foes. This version of the book includes a beautifully illustrated, limited edition, alternative-art cover (designed by artist Vance Kelly). Only one printing of this version of the book will be available.